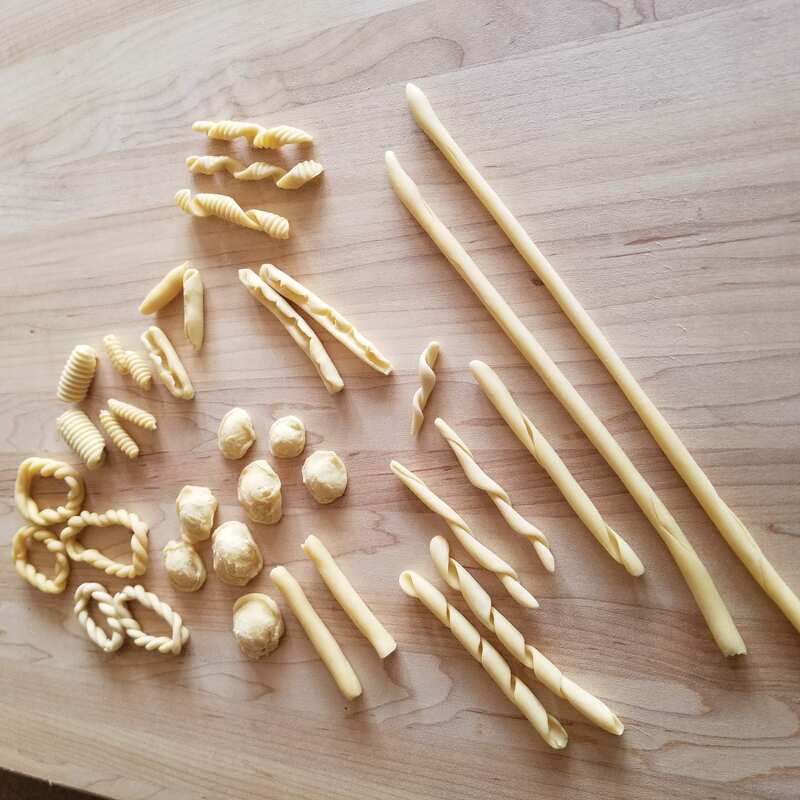 Spend an afternoon with cookbook author and teacher Rosetta Costantino and learn to shape traditional pasta from many regions of Southern Italy, made with only durum wheat flour and water. Using only your hands you will shape the dough in various shapes such as cavatelli, orecchiette, busiati, fusilli, gnocchi, lorighittas and more. At the end of class we will sit down and enjoy a lunch of four different pasta shapes with their own sauce. Cookbook author and teacher Rosetta Costantino was born and raised in Verbicaro, a small wine-producing hill town in Calabria, at the southern tip of the Italian peninsula. The family moved to the Bay Area when Rosetta was 14 years old, and though they settled into the fast pace of life there, they kept their traditions. They continued to grow their own produce, raise rabbits, make their own ricotta, and cure their own salsiccia Calabrese with spicy peperoncino from their garden. Even after she earned a chemical-engineering degree at the University of California Berkeley and went on to a successful career in Silicon Valley, Rosetta retained her love of her family’s traditional foodways. Rosetta shares her story, family traditions, and over 150 recipes in MY CALABRIA: Rustic Family Cooking from Italy’s Undiscovered South (November 2010). Written with San Francisco Chronicle food columnist and author Janet Fletcher ,and nominated for an IACP cookbook award, MY CALABRIAtransports readers to this unique food culture of rustic, homegrown, and homemade foods. Rosetta’s second book focusing on the desserts of Southern Italy was published by Ten Speed Press on October 2013 and has also been nominated for an IACP cookbook award.